Former Australian and Oceania Champion, and current 5th Dan Black Belt Instructor, Sensei Rosanna Kassis, is certified in Japan by 10th Dan Grand Master Kenei Mabuni. She has been training in the traditional art of Shitoryu for more than 20 years. She has competed successfully on all levels of competition in both disciplines of Kumite and Kata, achieving various gold medals in both Individual and Team events at State, National and International Championships. She represented Australia as member of the Australian National Team from 1999-2002. Once retired from competition Rosanna continued to pursue her teaching skills, and Referee and Judge licenses in sports karate. 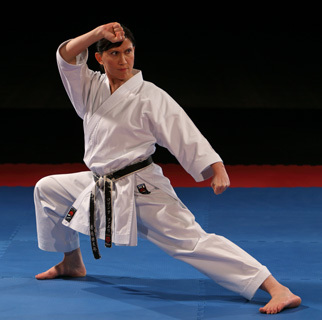 She now holds the qualification of World Kumite Referee A, and is the first female in Australia to achieve World Kata Judge A – the highest qualification within the World Karate Federation (WKF). This is a qualification held by very few women worldwide. Rosanna occasionally assists the National Squad providing technical input, and is a member of the Victorian Referee Commission. She also has a Certificate III in Fitness. Her greatest passion is to contribute to the physical and mental development in people, in particular to give positive influence to children in their formative years and to enhance everyone’s potential to be successful, through the Academy’s reputable training program.